Julia Badow is an abstract expressionist painter from Berlin, Germany. Moved by her fascination for colors, female empowerment, and ultimately the love to tell stories, she creates abstract works of vibrant, saturated hues, using acrylics on canvas and paper. Each piece has its own origin story, some more whimsical than others, some more investigative and others here to cheer you on. Her body of work is joyful in essence and her personality vivacious and welcoming. For licensing inquiries, contact me at magic@juliabadow.com. 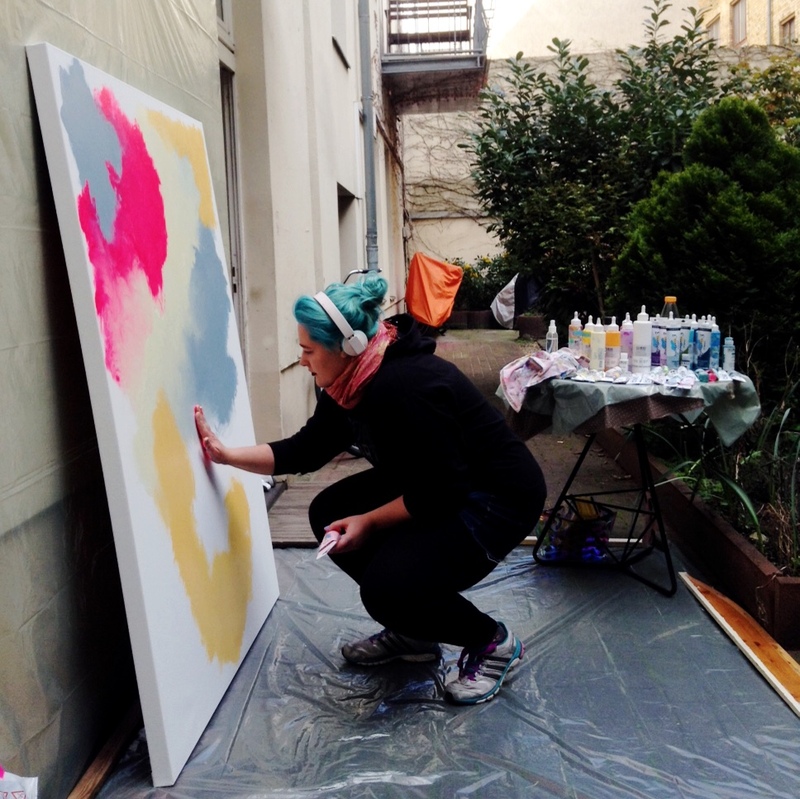 Hi, my name is Julia Badow and I'm an artist from Berlin, Germany. Art was always my favorite subject in school and I went to every available extracurricular activity that was even remotely art related. I knew early on I wanted to work in a creative field, even though I bounced between different future professions, like wanting to be an actress, fashion designer and even make-up artist (very short phase when I was 6). Straight after high school, I applied for art schools and put everything in it. all my resources, my time, even my health. Everyone told me only the best could get in and I was sure every art college would be lucky to have me. The first rejection letter came and I shrugged it of. Steadily working on my portfolio. Trying to find out what ‘THEY’ wanted to see. How I could condense myself into a few pages of paint and charcoal? I browsed the internet and looked for tips in forums and books, attended courses, life drawing classes and portfolio viewings. The rejection letters kept coming. I used all my money for art supplies and shipping my portfolio or traveling to different colleges in Germany and Austria, even the UK. And still I got nowhere near the final exam. Finally, after three years of rejection letters (you read that right, THREE YEARS), several internships and a failed attempt at ‘normal’ college I was part of the final 20 at one school and got accepted to the next. I got accepted. Wait what? FREEDOM! I was utterly free with no purpose in making art for the next months. I didn’t need to impress anyone or convince them I was good enough. I could do whatever I wanted with my art, now that I got in, and it felt exhilarating! And so I started painting. Just for myself, nobody needed to see it. I scraped paint around with old credit cards on canvas, put on loud music and just enjoyed myself. I even started just painting with my hands! There was a huge hole left where my "working on my portfolio" used to be. And I filled it with canvas after canvas of this new liberated me. I allowed myself to screw up, make mistakes. I allowed myself to be free. That’s why I paint with my fingers. That’s why I choose colors that are fun and make me happy, like lots of pink and blues and gold. That’s why people feel my sense of joy while looking at my paintings. That’s what makes me happy. That’s my ‘IT’, my ‘WHY’.I don’t try to figure out anymore, what other people want to see. Over the years I found that I really liked telling stories with my paintings and their titles, I dedicated a whole series to self-love in 2018 and love to empower women with my art and if it’s just by cheering them on one day at a time and giving them positive anchors with my canvases in their homes. Sign up to my newsletter and you get the best insight in my studio and art practice as well as 10% OFF on all originals, minis and prints.